An individual who is accorded NOR status can enjoy one or more NOR tax concessions when qualifying criteria are met. Qualifying individuals can enjoy favourable tax treatment under the NOR Scheme. Once granted, the NOR status is valid for a period of 5 consecutive years. A NOR taxpayer can enjoy time apportionment of his Singapore employment income such that Singapore tax applies only to income corresponding to the number of days spent in Singapore. This is relevant especially for frequent business travellers. As a NOR taxpayer, you can also enjoy tax exemption on contributions made by your employer to non-mandatory overseas pension fund or social security scheme. We can help you to prepare your tax return to incorporate the relevant NOR applications. 2) You are a non-tax resident for the past 3 YAs. If the resulting tax computed is less than 10% of your total employment income, you will be taxed at 10% of your total employment income instead. Director's fees and Singapore income tax payable by employer cannot be apportioned. The amount of contributions exempted is subject to a cap. The contribution must be borne by a Singapore entity. If you did not apply for NOR status in earlier years but can benefit from NOR concession now, an NOR application may be made this year. In this case, NOR status will be accorded retrospectively if you qualify. However, NOR tax concessions will not be available for the Years of Assessment that have passed. 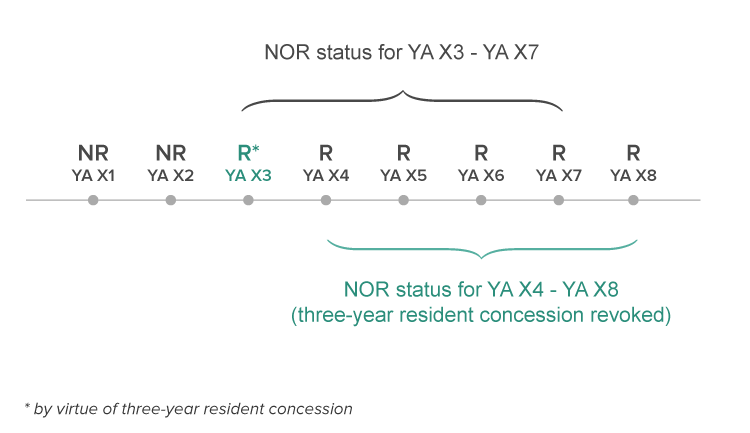 If you opted to be treated as Resident under the three-year resident concession for an earlier Year of Assessment, you may have the option of forgoing the concession and be assessed as Non-Resident in the earlier year so as to maximise benefits under the NOR Scheme. The NOR Application and duly certified Appendices have to be submitted to IRAS together with your annual tax return by 15 April of the assessment year. Qualifying individuals enjoy favourable tax treatment under the NOR scheme. Talk to us about your tax filing. Or if you've a question, drop us a note. Plan ahead. Make the best of your resources. Read articles and learn more from our blog.